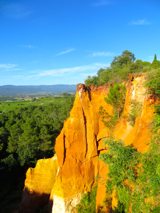 Surrounded by ochre cliffs, Roussillon is a colorful place! Ochre cliffs in late day sun. As a redhead, I quickly learned to recognize the word rousse in French, as people would use it to refer to my hair. When we arrived in the hilltop town of Roussillon, I got a whole new appreciation for the word rousse. Roussillon was long a center for mining ochre, an iron-based mineral that was traditionally used in paints. In fact, the cave paintings at Lascaux and Chauvet Cave used ochre. It was later used as a textile dye and in fine art painting. Its color can range from yellow to orange to red, sometimes even into purples. The cliffs and mines around Roussillon provide plenty of opportunities to see the range of colors. The town has capitalized on its name and the ochre deposits, and most of the buildings in the town reflect the colors. You can also visit the old ochre deposits and enjoy the Sentier des Ocres, a walking tour through the old mine area. and ochre deposits in the background. Beyond the ochre, Roussillon is known as one of the charming small hilltop towns in the Luberon. Located just 11 kilometers (7 miles) from Gordes, and 27 kilometers (17 miles) from L'Isle-sur-la-Sorgue, it makes a nice day trip. If possible, visit in the late afternoon, when the sun accentuates the colors. 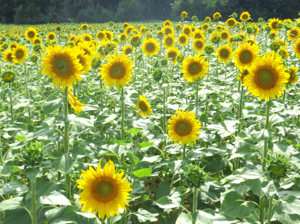 You might also consider Roussillon or one of the nearby villages as a base for visiting the Luberon. There is lots to see and do in this area. 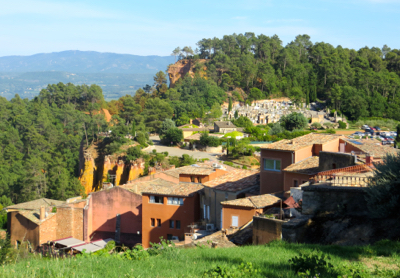 Roussillon can be very crowded during the day, but quiets down in the evenings and early morning. Roussillon has been protected from modern development and retains its old charm. There are a number of restaurants around the main square, and plenty of shops. Market day is Thursday. Be aware that parking is limited in the town center and is always payant in the tourist season. 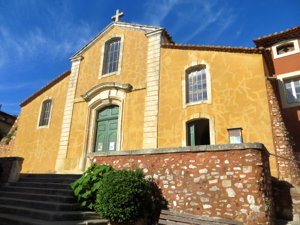 Above, The church in Roussillon, with its yellow ochre facade and colorful wall.